With the NCAA Track and Field Championships right around the corner, Oregon made a huge statement and cemented its status as favorites on both the men’s and women’s side. The Ducks men and women swept the PAC-12 Championships last weekend, despite missing some of their most important contributors. In the spirit of championship season, I would like to make a few predictions, while stressing that these predictions are only the personal opinions of this writer. First, I do not care what the computer rankings say. The rankings system is heavily flawed, especially for a team such as Oregon that hides its true potential during the regular season. The computer rankings would tell you Florida, followed by Texas A&M, will win the national title on the men’s side. That will not be the case. The Ducks will win the day yet again. The Gators and Aggies will be directly competing throughout the meet because their squads are strong in the same areas. This limits each of their opportunities to earn points. Marcus Chambers after his win in the 400 at the Pepsi Invitational. Florida and Texas A&M score high in the sprints, relays, and jumps. When you throw USC and LSU in the mix, you have four of the top teams in the country trying to steal points from each other within the same cluster of events. While Florida and the Aggies are the favorites, do not count out LSU in the 4×100 and 4×400 relays. In the open sprints I predict that USC’s Andre de Grasse will take home top honors, thus further eroding the Gator and Aggie point totals. This dog-eat-dog competition plays into Oregon’s hands perfectly. The Ducks strength lies primarily in its distance squad. Last indoor season the men’s distance runners scored 70 points alone to win nationals. The outdoors season will be no different. 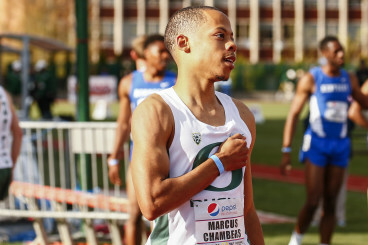 The Ducks are also bringing Marcus Chambers to nationals. Last week Chambers, who was absent during the indoor season, ran a personal best in the 400 meter dash with a time of 45.2. This sets him up to hopefully place high enough in the event to score for the team. Also missing from the men’s squad during the indoors season was Sam Crouser. Crouser will be a huge help for the men at the outdoor nationals since he has the second longest javelin throw this season in the NCAAs. Sam Crouser throwing at the Pepsi Invitational. In contrast, the Ducks will be missing Parker Stinson from its outdoor championship roster. Stinson’s eligibility ran out this past indoor season. 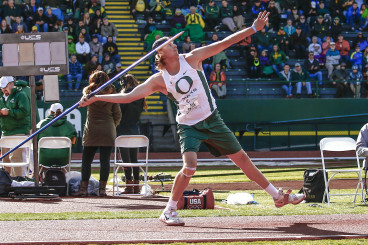 He has been a key in the Duck’s squad for a number of years, contributing points at championship meets. 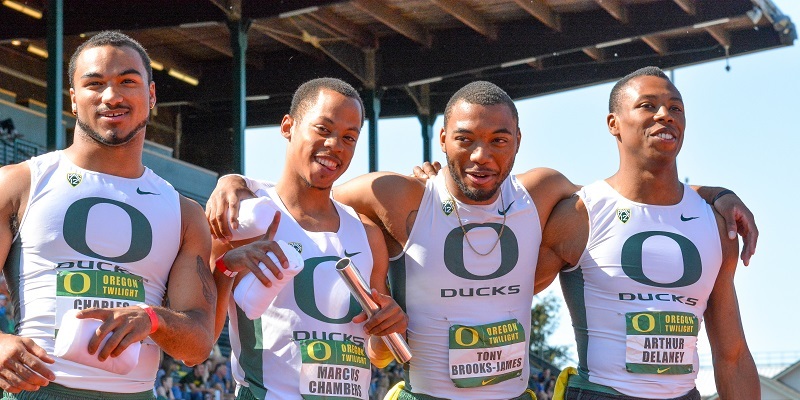 The Ducks distance medley relay team will also not run at the outdoor meet, which does not contest the event. This relay was great for the Ducks during the indoor championships as it allowed them to utilize their distance depth to grab an extra 10 points. With the above primer in place, below is a complete list of how I believe the Oregon men’s squad will perform at the NCAA meet. – Sam Crouser 2nd; 8 points. – Greg Skipper 4th; 5 points. – Marcus Chambers 5th; 4 points. – Nikolaus Frainzmair 5th; 4 points. – Johnny Gregorek 4th; 5 points. – Will Geoghegen 5th; 4 points. – Daniel Winn 6th; 3 points. – Edward Cheserek 1st; 10 points. – Eric Jenkins 2nd; 8 points. Based on this analysis, Oregon will score a total of 73 points. That should be enough to clinch the outdoor title with Florida, Texas A&M, USC, and LSU all cannibalizing each other. Tune in next week when I cover the women’s team.